The Scottish government could be given the power to issue its own bonds following a consultation, the UK Treasury has said. 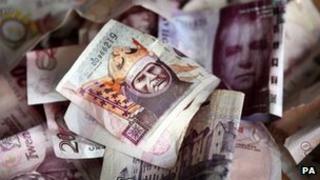 The move would allow Scottish ministers to raise hundreds of millions of pounds for major capital expenditure projects. A provision in the Scotland Act 2012 has already enabled the UK government to amend the way in which Scottish ministers can borrow from 2015-16. The consultation is being launched by the Chief Secretary to the Treasury. The move follows a commitment by the UK government to consult on whether borrowing powers should be extended to permit bond issuance, as part of a total £2.2bn borrowing limit. The consultation will gather views on the potential benefits and disadvantages for both Scotland and the rest of the UK of Scottish ministers issuing bonds. It will also consider value for money for Scottish and UK taxpayers, potential macroeconomic issues and alternative sources of borrowing. Chief Secretary to the Treasury, Danny Alexander, said the consultation launch took forward commitments made in the Scotland Act 2012. "I hope that academics, investors and other market participants will respond to this next step in potential further devolution of powers to Scotland," he added. The Act, which came into effect last month, will allow MSPs to set income tax rates in Scotland and enable Holyrood to borrow more money. It will also devolve powers over a range of other taxes, including stamp duty, land tax and landfill tax. Under existing powers, from 2015-16 the Scottish government will be able to borrow from the UK government, or from a commercial bank, up to 10% of their capital budget each year to fund additional capital projects, up to the overall £2.2bn limit. The consultation on bond issuance will run until 14 September.